We recognize that contractors have many types of equipment, and that you are looking for a mechanic that can repair everything in your fleet. 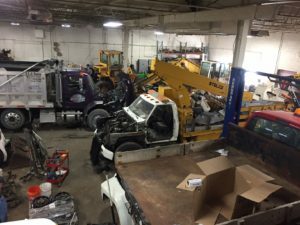 SBJ prides itself on being diverse enough to handle all your needs from small engines and pickup trucks to wheel loaders and 100,000 pound excavators, SBJ has a mechanic that can handle your repairs. Having your equipment serviced is important to keeping it in good condition and having operators change your oil is expensive. SBJ Services can provide on site servicing of your equipment, and we often times catch failures before they occur. This saves you money by eliminating downtime.